When Disney and Lucasfilm confirmed that they would not motion capture or include a CGI Leia in Star Wars 9, there was never any real talk about an actress coming into replace her. Which sounds like sacrilege unless it's a younger version of the character. As fans have long been in support of Stranger Things star Millie Bobby Brown coming in to play the Princess in a standalone Star Wars Story. But now some fierce rumors have begun to rear their ugly head that Meryl Streep will step into play the role once occupied by her longtime friend Carrie Fisher. Meryl Streep once famously played a version of Carrie Fisher in Postcards from The Edge, and already has some insight into Carrie Fisher's mind space when it comes to inhabiting this particular sci-fi icon. But Lucasfilm has already disturbed the fan base adequately enough with the very divisive The Last Jedi. Will they really trade an older Leia out? Carrie Fisher's death has left a giant hole in genre fandom, which is still felt to this day. And her death had a major impact on Star Wars fans, which is still being felt even more than a year after her passing. Most fans are probably okay with letting the character die between The Last Jedi and Star Wars 9, as she was allowed to ride off into the sunset in the previous chapter. The Last Jedi adaptation even sets up that Leia is suffering from her bout in space, and it gives them a perfect out in wrapping up the character's story arc. There is a problem. Leia was always meant to be the driving force behind Star Wars 9, such as Han was in The Force Awakens and Luke was in The Last Jedi. She was a main character in the script that ultimately got scrapped by fired director Colin Trevorrow. J.J. Abrams, who replaces the filmmaker, has already finished his script, and shooting begins this summer. There has been no official mention yet that he's bringing Leia back in any capacity. Would announcing Meryl Streep as Leia further alienate the Star Wars fan base? That's hugely possible. And it's also possible that Lucasfilm could be secretly letting this rumor spread to gauge fan discourse. It is rumored they did something similar with the first major reveal of Alden Ehrenreich as Han in Solo: A Star Wars Story. They wouldn't confirm nor deny that a poster floating around was the real thing, which it was, and it was a weird way to let fans have commentary without being told this was the real deal. When it comes to Leia, there is no doubt she was meant to play a larger role as this trilogy finished itself out. CGI is off the table. Writing her out of the story always seemed like the most logical step. In doing so, the Star Wars canon could officially write her out in a book, giving her a proper send off, before mentioning it in the opening crawl of Star Wars 9. They could kill Leia off on-screen without showing it. The final option is just to straight up recast Leia. Meryl Streep is the most obvious answer, and the least offensive at this point. But it still isn't going to sit right with a huge portion of the fan base no matter how you slice it. And the beloved Laura Dern is proof that it doesn't matter who the actor is. Behind Rose Tico, Holdo is one of the most hated aspects of the latest Star Wars adventure. An online petition has been launched, which is gaining some buzz. There are some fans that do want to see this happen. But its hard to gauge its authenticity. It states the following. "As the fans of STAR WARS and Carrie Fisher, we really want Leia to shine in Episode IX and we certainly do not want her to be written out of the film abruptly without a reasonable plot. 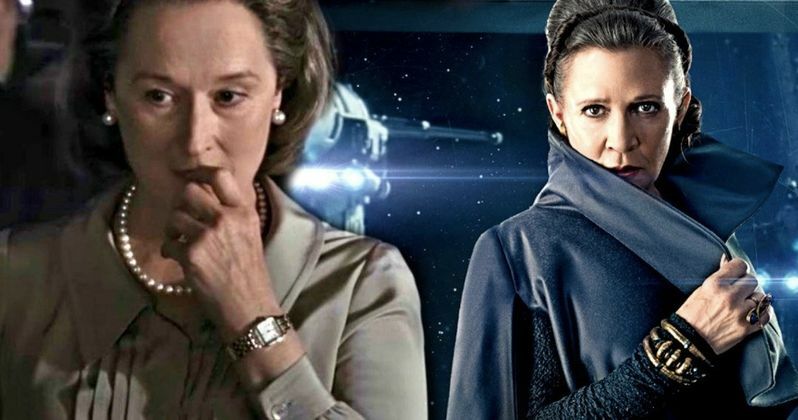 Therefore, recasting Leia is a more ideal option for us and we believe that Meryl Streep is an ideal candidate to play Leia. We strongly believed that she is the best hope for us to see the legacy of Carrie Fisher in Episode IX. May the force be with Carrie Fisher, Meryl Streep and Princess Leia." Though Carrie Fisher and Meryl Streep were fast, easy and long time friends in real life, its impossible to gauge how Carrie Fisher would have felt about being replaced. She always had a great sense of humor about the role, but she never talked much about leaving the franchise in such a case of her death. So let's not anyone put any words in her mouth. She may have loved the idea, or hated it. We'll never know. This news was covered at Dork Side of the Force.